This recipe is just a fantastic taste of Summer. 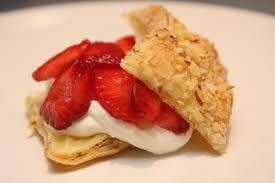 Strawberries, Cream, puff pastry… yum!!! Next time I make them I WILL take a photo and not just wolf it down! Preheat oven to 200˚C/fan 180˚C/ Gas 6. Unroll pastry sheet onto Rectangle Stone. Trim pastry edges to make rectangle measuring 30 x 23 cm; discard trimmings. Finely chop 40g of the almonds using Food Chopper. Combine chopped almonds and 2 tbsp of the granulated sugar; sprinkle evenly over surface of dough. Lightly press almond mixture into dough using Bakers Roller. Using Pizza Cutter, cut dough lengthways into three even strips; cut crossways into four even strips, making a total of 12 squares. Separate squares and position evenly over surface of baking stone. Bake 15-20 minutes or until cooked, puffed and golden brown. Remove from baking stone to Stackable Cooling Rack; cool completely. Zest entire orange using Zester/ Scorer. Combine zest and remaining granulated sugar in Prep Bowl; set aside. Pour cream into Stainless 4-Litre mixing Bowl; add 45g of the icing sugar and the almond extract. Whip using Double Balloon Whisk until cream forms soft peaks. Combine remaining icing sugar and mascarpone cheese in Stainless 2-litrs Mixing Bowl using Master Scraper. Add mascarpone mixture to whipped cream; whisk until combined and cream mixture is smooth and thick (don’t over-whip). Slice strawberries using Utility Knife. Split each pastry square in half; arrange half of the strawberries into bottom of each shell. Top each with about 2 heaped tbsp of the cream filling and sprinkle with chopped toasted almonds. Top with remaining strawberry slices and sprinkle with sugared orange zest. Place tops of pastries over filling. Serve immediately. Cooks Tip: Other small whole fresh berries such as raspberries or blueberries can be substituted for strawberries, if desired. Try using lemon or lime zest in place of orange zest. 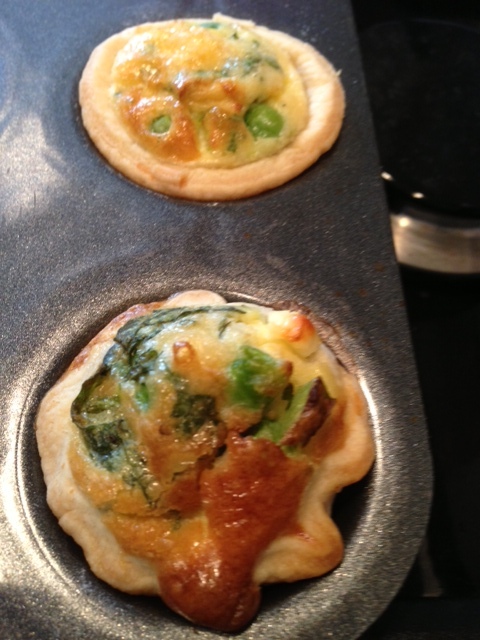 Here are the tartlets we made today at our Director Meeting. A lovely taste of Summer. I reckon you could easily scale them up and make them in some Mini Tart Pans for a gorgeous starter. Filed under Batter Bowl, Cheese, Citrus Fruits, Cream, Deluxe Mini Muffin Pan, Eggs, Food Chopper, Microplane Grater, Other, Pastry, Super Quick cooking! 3-4 tablespoons caramel or toffee flavoured dessert sauce, or maple syrup. Chop pecans and place in bowl. Add sugar and cinnamon/mixed spice – mix well. Set aside 40g (1.5 oz) of pecan mixture. Add flour to remaining pecan mixture and mix well. Add egg and vanilla; mix until blended. Set filling aside. Unroll croissant dough, separate into 12 triangles, and arrange in a circle (wide ends together) on the Classic Round Stone. Gently press edges of triangle together to seal. Spoon pecan mixture evenly onto widest end of each dough triangle. Cut apple in half and remove core. Place apple halves, cut sides down and crinkle cut each apple half crosswise into 5 mm (1/4 in) slices. Arrange apple slices over filling in a circular pattern. Sprinkle reserved pecan mixture evenly over apples. Bring outside points of triangles up over filling. Tuck under wide ends of dough at centre of ring (filling should not be completely covered). Place Baking Stone in Rack. Bake for 22-25 mins, or until deep golden brown. Drizzle with dessert sauce. Cut and serve warm. I have recently re-discovered this recipe. It is fabulous for canapes at parties or extra nibbles with lunch or just with a glass of wine. Preheat oven to 200C/ 180C fan/ Gas 6. Put soft cheese into Classic Batter Bowl and whisk until softened using Stainless Whisk. Grate Parmesan cheese into batter bowl using Microplane Coarse Grater; add pesto and mix well. Unroll pastry sheet onto lightly floured Cutting Board. Using Baker’s Roller, gently roll pastry to same size as cutting board. Spread cheese mixture evenly over the pastry using Small Mix ‘N Scraper. Fear not, it looks like it won’t cover the sheet but it will! Tightly roll the 2 longest sides up to meet in the middle. Using Forged Cutlery Utility Knife slice the pastry log, thinly for canapés, thicker for lunch accompaniements. Place slices cut-side up, onto stoneware, spacing slightly apart and re-neatening slices if necessary. Bake 12-16 mins for canapés or 20-25 minutes for thicker pastries until cooked and golden brown. Transfer to a serving plate using Mini Serving Spatula, serve warm. 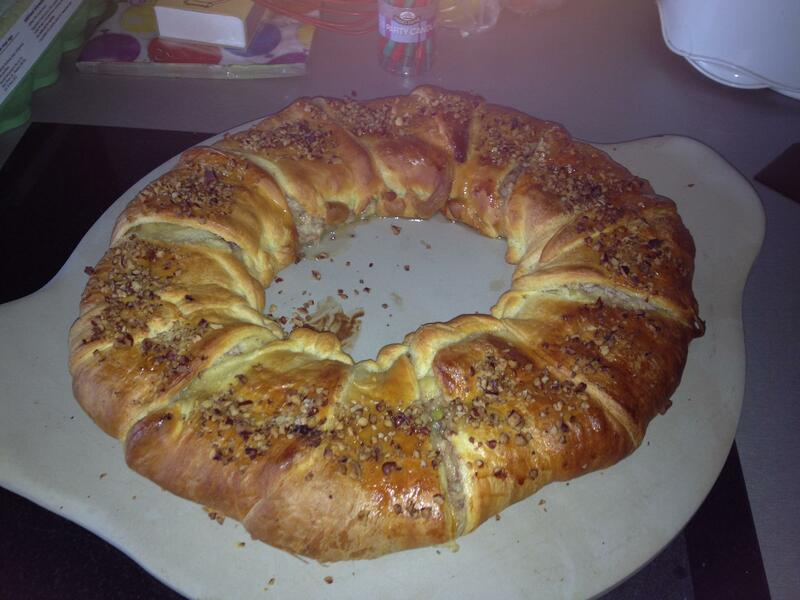 This is another filling for a fabulous Pampered Chef ring. Obviously with the mincemeat in it it is perfect for this time of year. 13cm opening in centre of stone). Gently press edges where they meet to seal. Separate egg using Egg Separator. Combine yolk with soft cheese and icing sugar in Small Batter Bowl. Chop the pecans using Food Chopper and combine with mincemeat and cinnamon in Classic Batter Bowl using Small Mix ‘N Scraper. Spread the cheese mixture in a circle in the centre of the dough triangles. Spread the mincemeat mixture on top. Peel, slice and core the apples and lay over the mincemeat. Bring the outside points of the triangles up over filling. Tuck under wide ends of dough at centre of ring (filling should not be completely covered). Bake for 20-25 minutes until dough is golden. Dust with icing sugar.